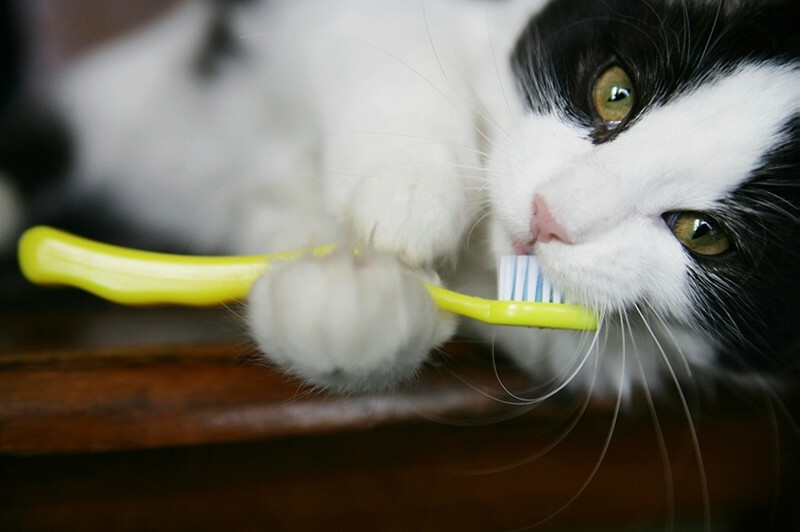 All cats are healthier, more comfortable and likely to live longer if they have their teeth brushed regularly! Unbrushed teeth tend to become infected and may loosen and fall out. This is painful and unhealthy, and the bacteria in dental disease can affect the whole body, especially the kidneys, heart, lungs and liver. 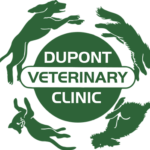 If your cat’s teeth and gums are already inflamed and infected, they should be cleaned by your vet, under anesthesia. The best time to start tooth brushing is when your cat is young, but older cats learn to accept tooth brushing as well. (1) CAT TOOTHPASTE: It tastes better and doesn’t upset their stomachs. (2 ) A SOFT TOOTHBRUSH: You can buy brushes made for cats, or you can use a child-sized, soft toothbrush. Brushes are better than plastic “finger brushes”. BRUSHING SHOULD NEVER TAKE MORE THAN ONE MINUTE! DON’T TRY TO DO A GOOD JOB, JUST DO IT! Both you and your cat will get more used to it and better at it, the more you do it. YOU DON’T HAVE TO BRUSH THE INSIDES OF THE TEETH! You don’t have to pry the mouth open, since almost all of the tartar forms on the outside surfaces of the teeth. Try to get back into the corners, though! YOU NEED TO BRUSH AT LEAST EVERY 1 TO 2 DAYS! It takes plaque (a film on the teeth) about 24 hours to harden and turn into tartar, which you can’t brush off. ALWAYS GIVE YOUR CAT A TREAT OR MEAL AFTERWARDS! It’s fine for them to eat after brushing, and they will co-operate much more when they expect a reward. IF YOUR CAT IS VERY NERVOUS OR HEAD-SHY, START OFF VERY SLOWLY! The first few times you may want to just hold the head still, or look under the lips, and then give a treat. Work up to brushing slowly if you have to. If you’re having trouble brushing your cat’s teeth, bring him or her in for us to show you how, or call us with questions! You can also watch the tooth brushing video on our website.